12:07 a.m. — Police were notified of yelling behind McDonald’s on Portland Way North. 12:16 a.m. — Police informed of a female being loud and yelling at Libby Lane apartments. Police issued a resident male a warning for intoxication. 3:31 a.m. — A resident of South Market Street reported a dog barking on his property. 5:35 a.m. — Caller from the 900 block of East Walnut Street believed someone had entered their home. Police found the home to be secure. 6:59 a.m. —Resident on John Street reported a broken window in their truck. 11:27 a.m. — A caller was trying to reach Domino’s Pizza to order, but calls were repeatedly unanswered. Police investigated to find business is locked up and dark. According to neighbor, employees have quit and they are currently trying to find new help. 11:38 a.m. — Police brought a bicycle that was found at a baseball field at Heise Park. 12:01 p.m. — A caller at Libby Lane Apartments reported their car had been hit while at Hyatt Court the prior evening. 2:49 p.m. — A male driver was arrested in the 700 block of Harding Way West for suspicion of OVI. 3:15 p.m. — A caller reported a bicycle theft in the 400 block of Portland Way North. 4:35 p.m. — A resident of Brookside Drive reported harassment from their landlord after receiving an eviction notice. 5:01 p.m. — Resident of Kelly Street reported their neighbor moved in a new trailer and hit their mailbox. The owner of the trailer will assist with fixing or replacing the mailbox. 5:56 p.m. —An employee of the Beverage Center on South Market Street reported that a kid purchased cigarettes and walked outside and gave them to another kid. 8:24 p.m. — A caller reported that her juvenile son was unruly and punching holes in the wall. The child was transported to speak with Community Counseling. 9:35 p.m. — A caller reported that a raccoon was stuck on a roof on a porch roof. 10:17 p.m. — Report that a lock was cut off of an abandoned house on West Atwood Street Police will notify realtor. 10:50 p.m. — Warning issued in the area of Rainbow Motel for a loud exhaust and missing plate light. 2:00 a.m. — Warning issued to driver for no license plate light. 10:22 a.m. — An employee at the meter department needs help with a possible utility theft on Grand St.
1:41 p.m. — A resident of North Liberty Street reported property damage. 4:03 p.m. — The owner of a rental property on East Church Street entered the property and found evidence of drug use. Items were collected by police. 5:46 p.m. — A caller on South Boston Street reported that the shed at the baseball field at South Park was open. 5:59 p.m. — Report of a dog attack on First Ave.
7:10 p.m. — A caller notified police of kids swimming by the pump house at Powers Reservoir. 8:48 p.m. — Received a call about a disagreement between two adults at Galion High School. 9:52p.m. — A caller notified police of a gun theft at a residence on Nazor Road. 3:52 a.m. — Police received a call from the 300 block of South Boston Street from a child who reported being kicked out of the home by a parent, and had no other place to go. The police returned the child to the home. 8:58 a.m. — An insurance card was found in the 300 block of Portland Way North and turned over to police. 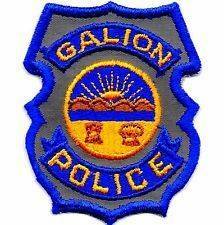 10:47 a.m. — Police received a call from the Emergency Department at Galion Hospital concerning to unresponsive males who had been dropped off by someone. One person was arrested on a probation violation. An investigation is continuing. 12:33 p.m. — A worker with the Galion Street Department dropped off a bike at the police station found in the 900 block of Smith Street. 4:51 p.m. — A traffic stop in Galion West Shopping Center resulted in the arrest of a Galion man on a Crawford County warrant. 10:19 a.m. — A report of vandalism to a garage was taken in the 200 block of W. Charles St.
10:58 a.m. — Officers picked up what appears to be drug paraphernalia found in the 400 block of S. Poplar. 12:15 p.m. — Officers spoke to a Cleland Ave. resident about a civil protection order violation. 12:31 p.m. — A report of two stolen laptops from the 600 block of Beverly Dr. was taken. 2:16 p.m. — Officers investigated a report of a breaking and entering in the 700 block of S. East St.
3:28 p.m. — A resident in the 400 block of W. Beal Avenue reported the flag stolen off her mailbox. 3:32 p.m. — A motorist in the area reported a disturbance in the parking lot of McDonalds. 5:43 p.m. — Cross country runners in the area of W. Southern Avenue reported seeing a suspicious vehicle driving through the area with a hand held Taser pointed out the window. 6:18 p.m. — Officers assisted an elderly male who was lost in the 1300 block of Lakewood Drive. 7:39 p.m. — A domestic disturbance on N. Sandusky Avenue was investigated. 8:06 p.m. — A 20-year-old man was arrested on two felony warrants out of Crawford County. He was transported to the Crawford County Justice Center to be held for court. 8:56 p.m. — A report of an intoxicated driver leaving the area of Wallace Avenue was investigated. 11:41 p.m. — Officers assisted Life Support Team in the 200 block of East Warren Street. with a 39-year old man who apparently overdosed. The man was treated and released at the hospital. 1:38 a.m. — Officers assisted Life Support Team in the 1500 block of Linwood Dr. with a woman that fell. 8:40 a.m. — Officers spoke to a 12-year-old boy in the 300 block of West Irving about his unruliness. 10:52 a.m. — Officers investigated a report of a possible breaking and entering in the 1700 block of Marion Road. 12:15 p.m. — Officers investigated a report of a disturbance in the 200 block of Bland Ave.
3:01 p.m. — Officers spoke to a woman in the 1000 block of Wingert St. regarding a found canoe. 3:42 p.m. — Officers recovered a vehicle stolen out of Richland County in the 100 block of Hall St. The vehicle was towed from the scene. 4:41 p.m. — A report of a cell phone stolen in the 500 block of S. Spring St. was investigated. 6 p.m. — Officers investigated a report of a possible breaking and entering in the 1000 block of High St.
6:31 p.m. — A report of a domestic dispute in the 1200 block of John St. was investigated. 8:18 p.m. — Officers checked the welfare of a puppy in the 500 block of Failor St.
10:05 p.m. — Officers checked the 400 block of Charlotte St. after a report of three suspicious men in the area. 10:50 p.m. — A 31-year-old Bucyrus man was arrested on a warrant and for shoplifting at Walmart. He is being held pending his court appearance. 11:19 p.m. — Officers spoke to a juvenile female who was experiencing some mental issues on Eloise St.